MF-101 Lowpass Filter, Filter from Moog Music in the Moogerfooger series. This thing is basically a whacked out wah/envelope follower with wide parameters so you can get some great sounds. This is 100% analog lovin. The only editing is the five knobs on its face. It is all 1/4&quot; audio. It is rackable if you buy the rackmount accessory (which holds three mf pedals all together). The configuration is simple in the fact that it has only 5 knobs, but like I said earlier, the parameters are WIDE. Because of this, you get quite a range of sounds from traditional wah to birds chirping while tripping on acid kinda stuff. The manual will give you some diagrams for &quot;presets&quot; and I recommend you learn them. Its confusing when on stage and you want a particular sound and you don't remember what positions the knobs are supposed to be. All the sounds out of this pedal are awesome! I write music in the vain of radiohead, flaming lips, sigur-ros, and others who love textured and melodic noise, so this things comes in very handy. I use this in my effects chain of my syth/drum sampler/alt vocals/etc. mixer and it gets used on all of them. It really sounds good on everything if you toy around and find the coolest config. I have had this for three years now. The best thing about this is the way the &quot;wah&quot; effect sounds on pads. Very eerie and ambient. The worst thing is how loud it can get when you mess with the resonance, but that is the nature of analog music. I just run a compressor after it and clip the ear piercing highs. I owned a dunlop crybaby before i got this, and the mf should be what the dunlop really was... a little baby. This thing cost $265 and I recommend buying the $40 expression pedal or it won't be nearly as fun. Its a lot of money, but once you start buying high end gear, you know exactly why it costs so much. If this thing ever breaks, i will do everything in my power to get another quickly. air1bzz's review (This content has been automatically translated from French)" Excellent but not for all"
Low-pass filter with fully analog envelope tracking. No editing or noon, the good old CV. Simple configuration provided it is a bit familiar with analog synthesis. However, the book provides very little educational explanations and audio examples that come with it. I want to say that the quality of the filter is legendary for nothing. This is analog, it's hot and very round, it can be very mild or nervous with a little more gain and resonance. However I use this pedal for several years with a guitar, and if you want a good auto-wah: go your way. Let me explain: there is therefore a tracking device on this envelope, gold, depending on the output of your guitar and the sustain you very different results. For my part, the envelope is often too short, I can increase it by pushing the drive but the sound begins to saturate, and suddenly the envelope in its amplitude max, makes bubbles in the filter. Basically, what's missing in this pedal to make a good auto-wah from scratch, this is a real ADSR envelope. Fortunately, she can do much more than that because you can control each knob foot pedal via CV (moog EP-2 type) or connect an LFO another MoogerFooger on the filter for example. For those who prefer analos synths, go with eyes closed. 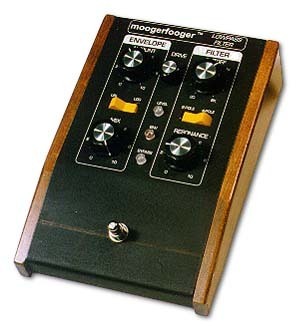 This filter allows you to "moogifier" any synth from the VCA envelope. I use it for a decade. This is a very robust pedal, excellent craftsmanship with a legendary sound. 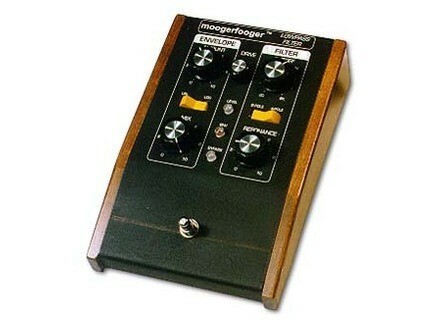 The quality / price ratio Moog, it's very expensive but it is ... But I separated for a more suitable guitar filter, sort excellent Sonuus Wahoo. Comprehensive configuration, take the time to find the sound and it must also know the principle of an envelope filter, it helps. Very good sound quality, great presence and definition, for lovers of vintage, this is the top, the MOOG quality wholesale. I find it more relevant (warmer and finer) than the EBS IQ fingers. For it is less effective against slap. The gain knob drive is simply insane, it's my sense that the lack of pluparts envelope filter, little sounds sought to Jamiroquai and Daft Punk. Against by the same gain is not releasable to the effect, that means that if you set a sound with a lot of drive, you will find it on your drive clear sound, so I suggest this effect to a couple A / B box with level control loop (type LS2 boss). Amok_'s review (This content has been automatically translated from French)" Good autowah / drive for synth bass and"
Not obvious at first, you eventually master this in one evening! The general editing is easy and you can always find a good compromise with possible adjustments between the intensity of the effect, the rate of activation (envelope) and cutoff. Resonance is the icing on the cake. This effect is great for bass, whether it be a bass guitar or synth. For lad / a synth pad is interesting, and even the organ. The drive more or less pushed, gives a punch and a safe really great. This works well on a bass guitar, synth VA (North lead, ...), and even an analog synth. For digital synth, the analog drive side is very nice. The sound quality is the appointment, like all moogerfooger. I've had 4 months without a mandatory equipment, is really great for any bassist or keyboardist. I use it on bass, on digital and analog synth. It warms my Nordlead beautifully and gives punch to my old jx3p (analog) that does not have a great level of output. For bass, it may be the only pedal required. chcrosne's review (This content has been automatically translated from French)" Terrible"
Are they editable? Via an editor Mac / PC? 'Is it a rack or rack-mount model? Expression pedals will on for the settings - output of the envelope or audio out-we can say that the pedals offer a range of possibilities coronation and connectors. while a high quality that is worth more than many other effects because it is richer, too. To me it was worth the money. That's it said. I do not understand the opposing views: bypass impeccable ndnature not sound nor cre one breath, so it remains on the pramp on but it's a matter of rglage, possibility to find almost the sound of entremme through the filters or not at all (since it is what is asked). At least for me, on his Rhodes. The preamp is saying ... bad! it distorts really the sound of my guitar, bass and synths! In the studio it's not that serious, but on stage is intolerable!! considering the price is rather unfortunate! I advise against by the pedals on keyboards plutt as guitars and basses, because I find it incorporated more of my earnings and my juno moog as gains plutt of my guitars and low, but it is subjective because I read conflicting opinions (especially bass players ).... see! In any case, try it before you buy! I do not use it since trs long, but I am convinced that DJ will not leave me to sitt, because it is really an effect on top of what may be in the Contents, and in addition is superb! synths like the brand is attached to it fast! the pedals are in line with what has cre good old Bob!